Nokia Steel is more of an activity tracker rather than a smartwatch, but at this price, it might not even matter. The wearable device is available in three colors – Black, White, and Rose Gold, but if you want to pay less than the suggested retail price you have one choice only. 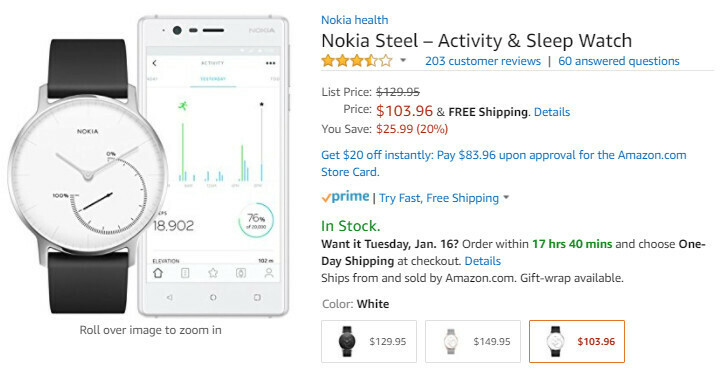 Amazon is selling the White Nokia Steel for 20% off, which means you can get now for just $104. The Black version sells for $130, while the Rose Gold is up for purchase for $150. The Nokia Steel offers 24/7 seamless tracking, including automatic walk, run, swim and more than activities recognized. In addition, you can check calories burned and distance whenever you feel like you've done some progress. Another important feature, sleep monitoring provides users with sleep cycle analysis and offers silent vibrating alarm with Smart Wake-Up to wake users at the optimal point. Moreover, you visualize trends and data on your smartphone with the free Nokia Health Mate app. According to Nokia, the Steel activity tracker should get you up to 8-month battery life, which is pretty neat. I want the other one that is rechargeable and last 25 days per charge.